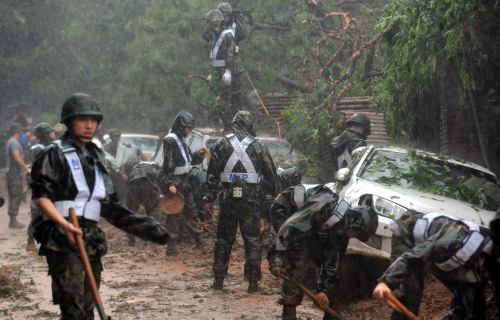 The military has ordered a search in southern Seoul, as well as in Gyeonggi and Gangwon Provinces to verify whether landmines and other ammunitions were washed into populated areas following torrential rains this week, officials said Thursday. It has also sent some 1,700 troops and heavy equipment to help restore the areas that were hard-hit by the downpours that have left more than 50 people dead or missing. “We ordered relevant military units to search for and detect landmines in areas affected by the torrential downpours,” said the Joint Chiefs of Staff in a press release. The JCS asked that citizens immediately report to nearby military units or police any devices they come across without touching them. When a report on landmines is received, the military sends its Explosive Ordnance Disposal team to take care of them, officials said. The military is also investigating the possibility that some landmines believed to have been planted somewhere on Mount Umyeon in southern Seoul could have been washed away by the rain. “In the past, we carried out operations to dispose of landmines in this area. Some 10 landmines have yet to be disposed of. We are investigating whether they were washed away,” a military official said on condition of anonymity. On Twitter, news that the landmines might have been washed away was spreading rapidly, escalating public concerns. However, the military said that the mines were not buried in areas hit by the downpours. Military restoration support is now concentrated in the central regions of the Korean Peninsula, the most affected by the rains. Among other units, the Capital Defense Command sent 1,300 soldiers and equipment such as a drilling machine and trucks to affected areas in Seoul. The Army 52nd Division sent 740 troops and 16 pieces of equipment to affected areas in Gyeonggi Province.